The famous Tintern Abbey is located in a very picturesque area, in South Wales. The place of religious temple, which today are mostly ruins left, is only closed between Wye River and south of the village Tintern. This beautiful natural region is located only 8 km from the town of Chepstow. Tintern Abbey was the first Cistercian monastery in the spirit of the territory of Wales and the second similar in England. It was founded in 1131 by Cistercian monks. A century later it was rebuilt as a dwelling for about 400 monks. At that time the so-called community of Black Death often attacked the religious community, but the abbey survived until 1536. Later, the monastery again suffered many years of being in a Derelict state and destruction at the time of Henry VIII, who led the campaign against churches and religious monasteries. Today tourists visiting Tintern abbey enter for free. The most important building here is a Gothic church, which is preserved in relatively good condition and is mostly complete. The building has no roof. The temple is about 70 meters long, the entire south arcade and gallery inside are reserved. Most of the columns are also in good condition and standing up. They hold beautifully crafted arches. To this day in the beautiful architecture of the temple are performed religious services. Around the Gothic church are the ruins of several smaller buildings that are in poor condition, but still interesting. 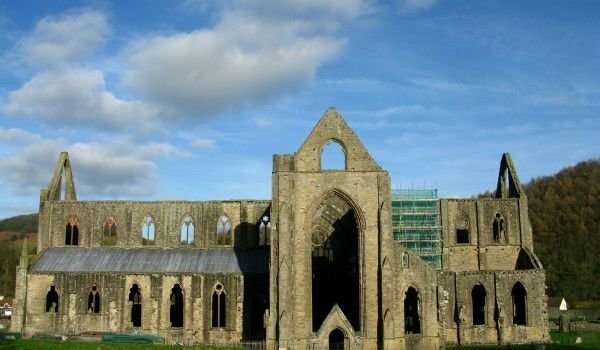 To maintain the health of Tintern Abbey, the Welsh care agency for protection and conservation of historical monuments periodically performs restoration activities on the building.